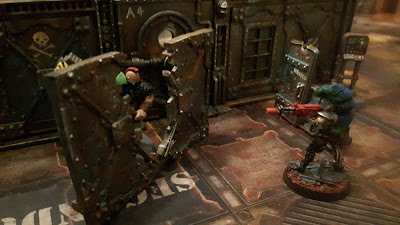 I may have mentioned somewhere that I was lucky enough to receive the new Necromunda box set for Christmas and split it with my brother, Blazmo, of Tabletop Apocalypse. We've both been building and painting the gangs and managed to get our first games in last week. I have to say it was an absolute blast! Unfortunately, I didn't manage to get any of my gangers painted for their first outing on the tabletop. But the excitement of playing the game spurred me on to finish painting my first gang Champion; namely Hoyt 'Bulky' Bennett, pictured above. 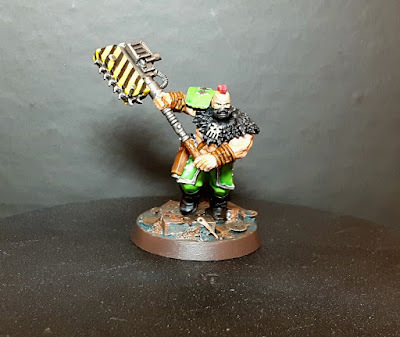 For those who aren't familiar with the new Necromunda, a starting gang is made up of a gang leader and can include a number of gangers, juves and champions up to the value of 1000 credits (basically points). This usually gives a gang size between 6 and 10 models. Juves are basically wannabe gangers who are inexperienced and poorly armed but learn quickly and are cheap to hire; whereas Champions are experienced fighters with powerful skills and with access to better weaponry. Hoyt himself is armed with a mighty Renderizer (ok I know it's a converted chainaxe but it's close enough) and a stub gun; both of which he failed miserably to use on his first outing as he spent most of the game pinned and rolling about on the floor. The game itself is very dynamic as gangers variously get hit, pinned, wounded and eventually taken out of action. 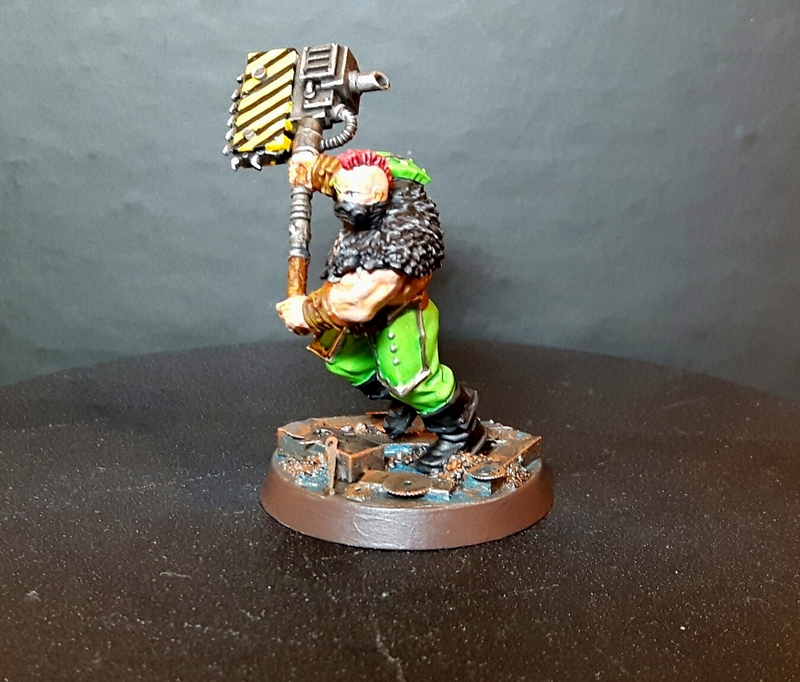 As with the original Necromunda, there is a lot of laying your models face down/up to show the state of their various injuries. So long as you're careful though it doesn't seem to cause them any harm. 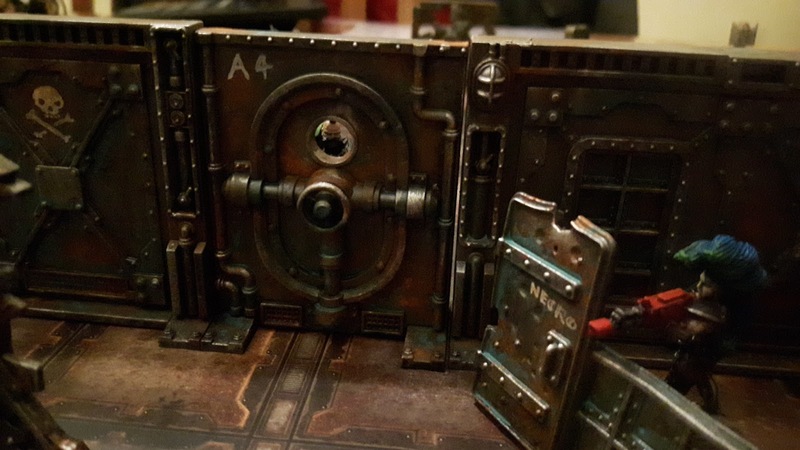 The boxed game includes a number of boards which can be used for zone mortalis style play. Something both Blazmo and myself thought we would avoid but which was surprisingly enjoyable to play. So much so that we will probably use this format for most of our games. The game also comes with a set of scenery (mostly bulkheads and barricades) which can be seen pictured above. Big thanks to Blazmo by the way for painting all the scenery in record time and making our games all the more immersive. Peakaboo! I couldn't resist this photo. If you've read much about the new Necromunda online (or N17 as it's often called) you may know that there are a number of rules errors in both of the source books (Underhive and Gang War). Games Workshop have advised that an faq is imminent but until it lands it is probably best to play the game with a series of gentleman's agreements in place (much like the original ruleset!) Still, it hasn't spoiled my enjoyment of the game any; if anything, I think it encourages people to play more in the spirit of the game. Painting wise, I've really enjoyed breaking away from the grimdarkness and trying to paint some bright, cashing colours in more of a second edition style. With this in mind, I've gone for a nice lime green paired with a red spot colour and some hazard striping. I'm not totally happy with the hazard stripes but you only get better at these things by doing them! So I'm determined to put some on every member of the gang. The base was inspired by Blazmo's excellent terrain with a rust/verdigris style that works nicely for the underhive. As for the future? 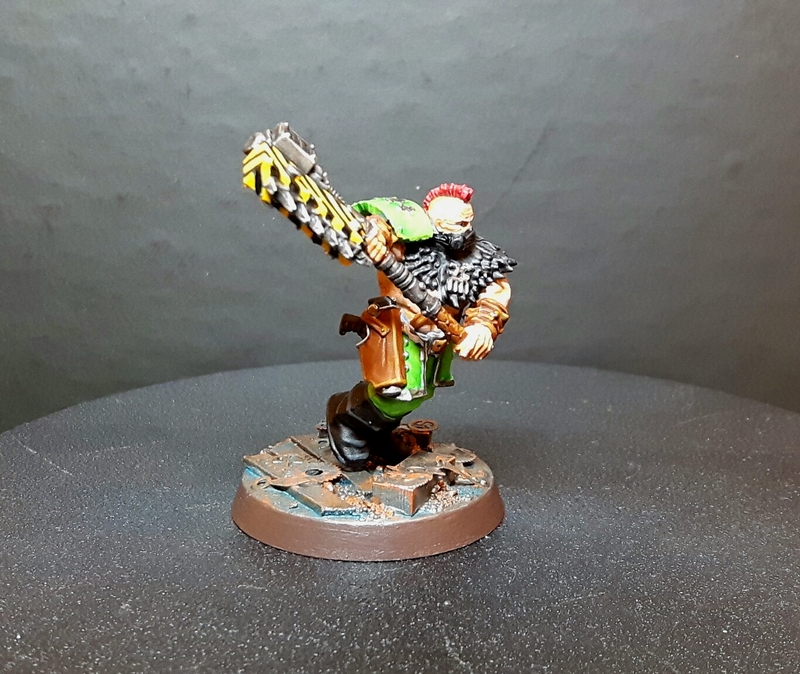 Well I'm working on painting my gang leader at the moment and I sincerely hope to get more games of Necromunda in soon. Check back soon for more updates.